Ok, it took me a long time to finally take pictures of the things I have sewn over the past weeks. For some reason, I didn't feel like posing for a couple of weeks. At last, I bit the bullet. Yesterday, I did my hair, even applied make-up and made good use of E's presence and willingness to take pictures. So, now I have four more things to show you (each in its own post). At least, I think it was four... No, five. It is made from a nice but not-so-stretchy dark blue cotton jersey. The fabric has been in my stash for quite a while and I used to have very ambitious plans for it. Violent-like draping. Something along that line. In the end, I didn't try that. It would be a lot of work for a not very practical garment and I might even find out that the fabric was actually a bit to bulky for gathered bits (as jersey so often is). Instead, the fairly large amount of fabric (close to 4 meters, I think) would be perfect for another idea I had in mind of a while. This dress. The original blog post is here. I made it using this tutorial from Studio Faro (another Pattern Puzzle), which was in turn based on a vintage pattern illustration. Even back then, in 2014, I realized how easy it would be to turn the top into a dress by adding a circle skirt to it. However, I thought the blouse-y body wouldn't look very goor with a full skirt. After that, I didn't think about it for years. Until some point in May when I put on the top again. This time, I started pulling at it to try and find a way to take it in a bit. This top is made from a rather unusual pattern shape so adjusting the size is not straightforward. But I found an easy way to do it. This is the pattern as draft it according to the instructions on the well-suited blog (I believe it's supposed to be a size 38, which is a bit too big for me). My top was made exactly like this, just with a fairly short and narrow strap because I didn't have a lot of fabric. When constructed, the top has a center back seam at the bottom half of your back and one long horizontal seam which runs over the bottom ends of your shoulder blades and along the sleeves (unlike for most pattern puzzles, the construction of this top is also shown in the Studio Faro post). It is that last seam which holds the key to adjusting the fit! I ended up cutting the pattern like you can see here, along the solid red lines. I tried it out by pinning my existing top and ended up taking almost 10 cm from both the top and bottom piece, tapering to nothing in sleeve seams. This results in a more fitted bodice and less draping at the neckline (without losing all of it). In my opinion, much more flattering. Of course, the fit of a this thing would always depend on your shape and size, so if you are interested in making something like this, I would heartily recommend making the top first and going from there. I believe there is also a post about drafting it in a bigger size somewhere on the same blog, but I'm not sure (that might also be for the other retro wrap top). Anyway, for this version I made a waistband which is 8 cm wide and was made from separate pieces for the in- and outside. This was needed so it would have seams at the top and bottom to encase both bodice and skirt. I also cut its length in two pieces to allow for a hole at the side to pull one of the ties through. And I made the ties in different lengths so the right place to tie the dress would be at the end of the front overlap, not at the back. The skirt is simply a full circle, cut without seams (the fabric was wide enough to make that possible). 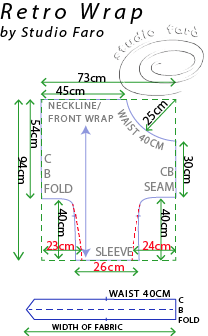 Because this is a true wrap dress, part of the fullness of the skirt goes into creating a safe amount of overlap. It's a bit too warm to wear this dress now, but I am pretty happy with it and I'm sure I will wear it a lot. I'm not sure it still looks very 1950's. The top does, but something about the lines of the skirt in this flow-y fabric makes me think of the 1970's. Not that I care. It suits me, that's much more important. 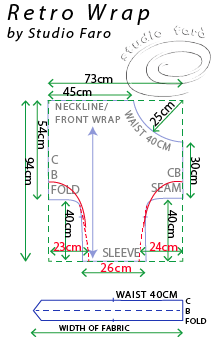 This fits very nicely at the neck wrap, which I think is the major part of making a wrap dress comfortable! Very pretty proportions and taking in that bit in the bodice made it fit much better. Excellent! P.S. Maybe because I wear navy every darn day for my flight attendant uniform, I think you need a silky little neck scarf (which I refuse to wear) and some wings...Just being a dork, you look very elegant! That is a deeply handsome piece of work, in a beautiful color, and you are just delightful in it. Laughter is always good. Thank for the diagrams of the changes you made in the top. It looks perfect now, and this is a beautiful dress.